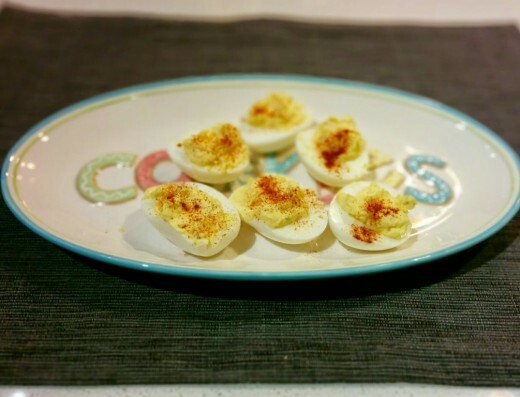 Deviled eggs are a Tondryk family tradition at any Holiday get-together. I remember hovering around my Grandma’s island in her kitchen with all of the cousins, eating deviled eggs and potato chips with Top the Tater. And that was pre-Holiday meal! No wonder I was always stuffed. 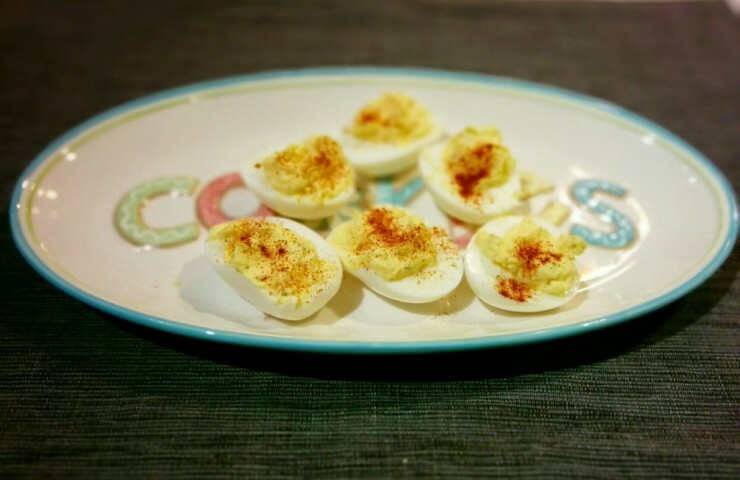 In addition to being the go-to cheese ball maker on Christmas Eve, my dad is known for making very delicious deviled eggs. This recipe comes from him and he shared with me several variations that I will include in the recipe below. Start by hard boiling eggs. 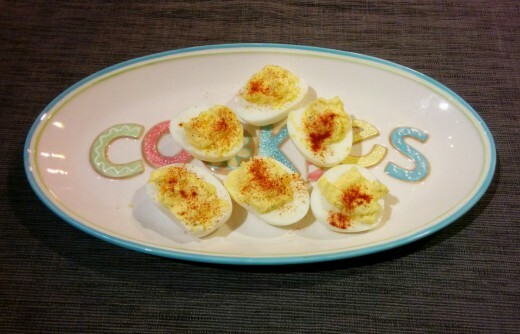 To make 12 deviled eggs, hard boil 6 eggs. I made a small batch so I cut the recipe in half and only cooked 3 eggs. Add the eggs to a saucepan and add enough cool water to cover the eggs about 1 inch. Heat to a boil, then cover the pan with a lid and remove from the heat. Set the timer for 12 minutes and let the eggs cook. After 12 minutes, remove the eggs and submerge in ice water to stop the cooking process. Peel the eggs and rinse under cold water to remove any residual pieces of shell. 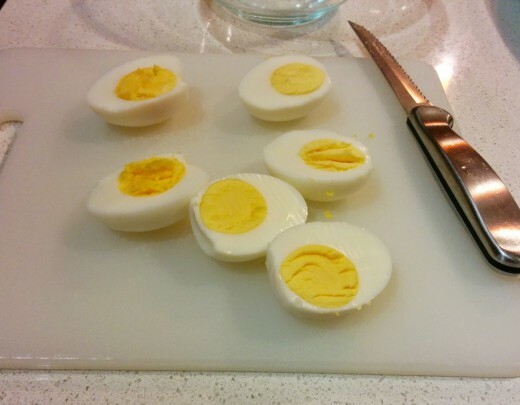 Slice each egg in half lengthwise. Carefully scoop the yolks from each half into a small bowl. 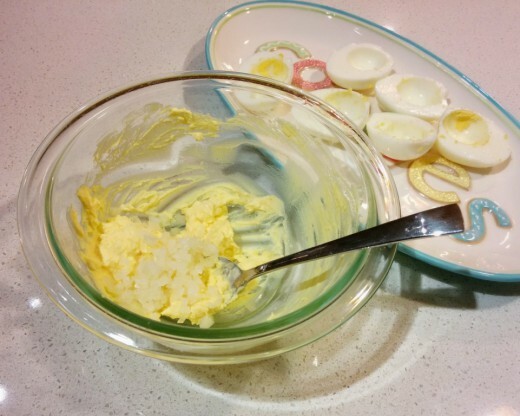 Lightly mash the yolks then add 4 tablespoons of mayonnaise and 3 tablespoons of very finely diced onions. Use dried onions instead of raw or add minced garlic if you’d like. In addition, you can substitute horseradish or garlic mayonnaise for some of the mayonnaise. Season with salt and pepper to taste, then spoon the egg mixture back into the egg whites. Sprinkle with paprika before serving. If you want to get really fancy, top each deviled egg with lobster. We recently had some of these at Cafe Nola on Bainbridge Island. Yum! Place eggs in a saucepan and add enough cool water to cover the eggs about 1 inch. Bring to a boil, then cover the pan with a lid and remove from the heat. Transfer the eggs to ice water to stop the cooking. Peel the eggs and rinse with water to remove any residual pieces of shell. 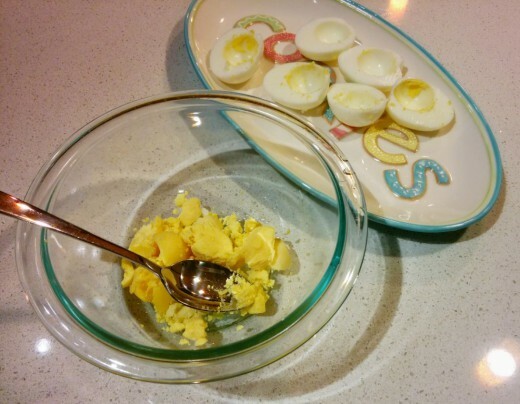 Scoop each yolk into a small bowl. Add in mayonnaise, diced onions, salt and pepper. Carefully spoon the mixture back into each egg white. Sprinkle with paprika before serving.